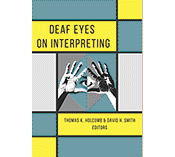 This is the nineteenth weekly installment featuring highlights from the 20 chapters in the new book, Deaf Eyes on Interpreting, edited by Thomas K. Holcomb and David H. Smith, which was released in June by Gallaudet University Press. 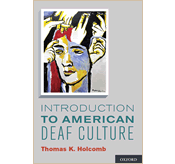 In this chapter, co-authors, Chris Kurz, Kim Kurz and Raychelle Harris promote a Deaf-centered model of interpreting. Currently, most deaf children are mainstreamed and receive their educational content through interpreters, not directly from teachers in their first language. The goal of this chapter is to help interpreters become more effective in presenting information in ways that Deaf children can really understand and learn academic material such as math, science, and history. The co-authors’ work is based on empirical findings in brain research, academic ASL, and language acquisition. One example from the research has shown that the brain seeks patterns and relationships in order to compartmentalize knowledge, thus making it easier to recall at a later time. 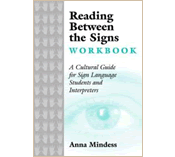 They urge interpreters to tap into valuable resources in the Deaf community, such as Deaf mathematicians and scientists who have grown up using ASL, as well as Certified Deaf Interpreters and learn from them how to best present complex information in ASL. 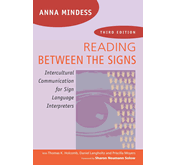 Posted in ASL, Deaf academics, Deaf Eyes on Interpreting, Deaf Interpreters, Deaf-centered interpreting, Educational interpreting, interpreters, Mainstreamed settings, New book, Deaf Eyes on Interpreting, videos from book contributors and tagged academic ASL, Chris Kurz, Deaf Eyes on Interpreting, Deaf-centered interpreting, Kim Kurz, Mainstreamed settings, Raychelle Harris. Bookmark the permalink.